Enjoy unforgettable sunsets in Cape Coral - Florida. 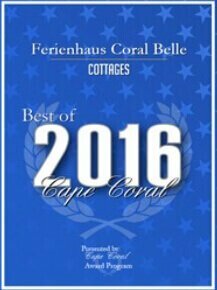 Our exclusive vacation home equipped with great attention to details lies in the Southwest of Florida in Cape Coral. It`s located directly on the water with a fantastic view and its own boat dock with a connection to the Gulf of Mexico. Even though the house is centrally located, it offers the best possibilties to escape from the daily stress. To get an even better impression of our vacation home, simply click on the video. 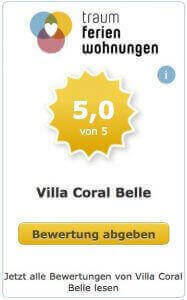 We already knew that our vacation home is excellent, but now it´s officially. Cape Coral is in Lee County Florida which is one of the largest cities with a population of approx. 180.000. The city area ranges over 298.1 square kilometers – Cape Coral is the second largest city in Florida. 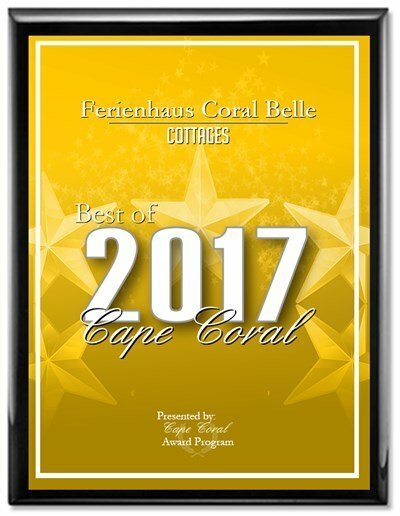 Also in the crime statistics Cape Coral is in second place of the safest cities in Florida, making it an ideal destination for families. Cape Coral is also known as the Venice of Florida, because its numerous Canals add up to the total length of about 650km. The climate is mild and warm, often with a light steady breeze from the sea. Statistically, it rains in Cape Coral in the summer months to an average of 30% of the day, although only temporarily. 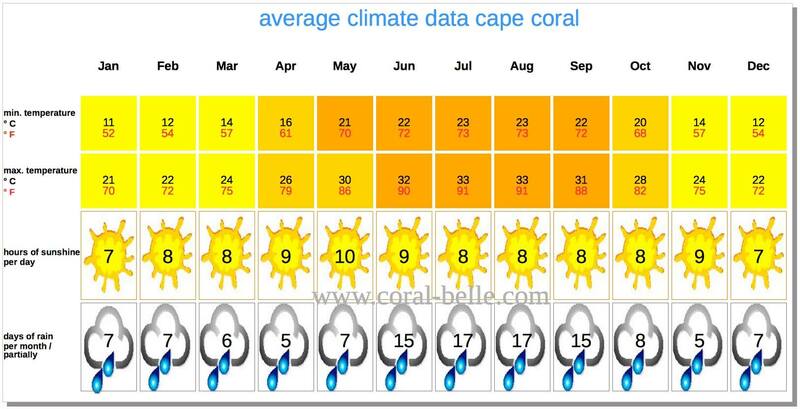 The highest temperatures are from May to October with up to 33 ° C. The coldest months are from December to February with an average of only 24 ° C. Snowfall is almost unknown in Florida. Florida (an approximately 700 km long peninsula protruding into the sea) stands for pure holiday feeling. The “Sunshine State” (the name says it all) has approximately 19 million inhabitants and a total area of approximately 140,000 km². Therefore Florida takes rank 22 of the geographically largest US States. To the west of Florida there is the Gulf of Mexico with its magnificent sandy beaches and on the eastern side the Atlantic Ocean. You find the cities Miami, Fort Lauderdale, West Palm Beach or Boca Raton on the coast. In Central Florida you find very few large cities. Orlando (entertainment capital of the world) or Tallahassee (Florida’s capital) here remain the exception. South Florida consists mainly of swamps, which are also called Everglades. Most of the population has settled also because of tourism in the immediate coastal regions. Florida is next to California the most popular state in the US. This has the consequence that the population continues to rise steadily. Florida is also known for its many citrus orchards. From here, large parts of the US are provided. The highest elevation in Florida is about 100 meters above sea level. The southernmost point in Florida are the “Florida Keys” with their world-famous ultimate destination Key West. The Keys extend like a pearl necklace about 160 km wide into the Gulf of Mexico. Holiday rentals (like our house) can be found in Florida mainly on the west coast (where Cape Coral is also located) on the Gulf of Mexico. Some of the most beautiful beaches are also located in this region. The Villa Coral Belle is the ideal starting point to discover Florida and its various attractions. Since January 12, 2009, non-american citizens/travelers without a visa must register at least 72 hours before departure for the US on the ESTA online system.